We went to the Brew Kettle with butterandjelly a couple of Wednesdays ago, and while there I tasted (and completed!) 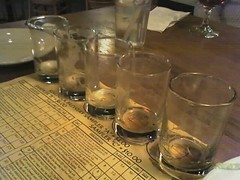 a sampler flight of beers. Amazingly, after years of hating beer with a vengeance, I've started to find things that, beyond merely not offending my palate, and pretty damn tasty! So far I'm mostly preferring porters, stouts, and Belgian things, as long as they are "good"--I think my previous issues, like those with seafood and wine, were due to the fact that I'd never really had anything worth having.